18kt. 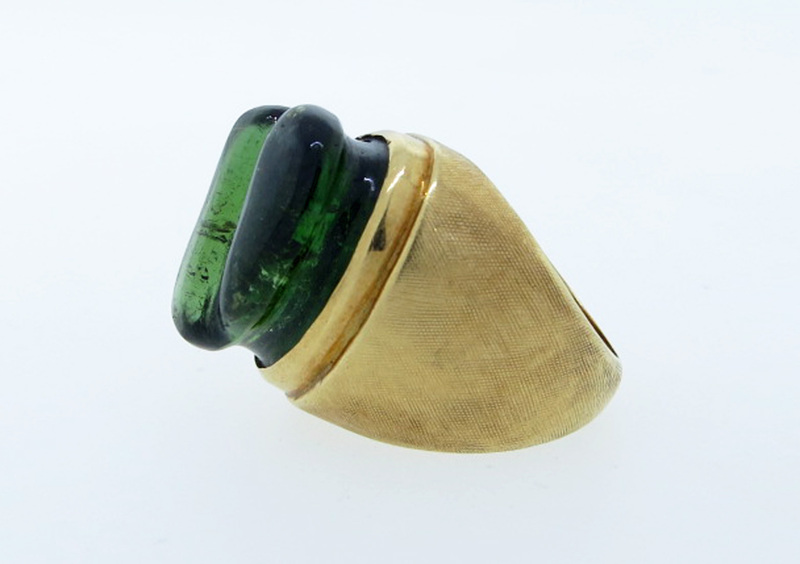 carved tourmaline ring circa 1960. The ring is size 4 1/2 and can be sized modestly. Opposing Clip back 18kt. yellow gold earring made by the London jeweler Leo De Vroomen. Each earring measures approx 1 1/2 inches in length with two color blue enamel and hematite centers. Posts can be added. 18kt. yellow gold double clip back brooch measuring approx 4 1/4 inches in length. Each end is set with a sugar loaf cabochon amethyst. The center is bead set with a platinum inset bead set with 19 round brilliant cut diamonds totaling approx .75 cts. The brooch weighs 28.3 gr. 18kt. yellow gold carved double clip back brooch made by Seaman Schepps measuring two inches in length. Fluid link 18kt. mount diamond bracelet made Hammerman Brothers. The links are prong set in white gold with 29 round brilliant cut diamonds totaling approx 6.0 cts. The diamonds grade VS clarity G color. The bracelet measures approx 6 1/2 inches in length and weighs 71.4 gr. 18kt. classically inspired pair of column broochs the larger brooch measures 1 1/2 inches the smaller one is .90 inches. Signed Dunay. Supple 18kt. link necklace made by Alex Sepkus. 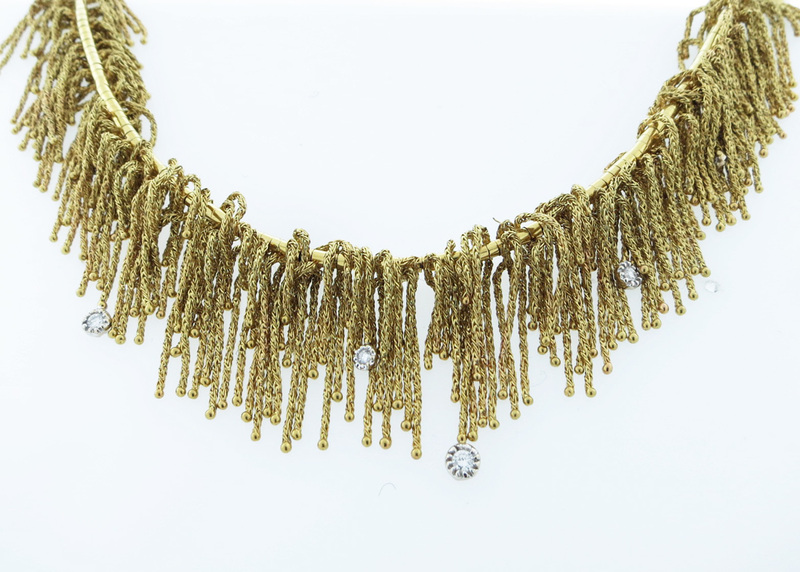 The neckalce measures 15 1/2 inches in length and is meticulously bezel set with approx 6.75 cts. of round brilliant cut diamonds grading VS clarity G color. The necklace retailed for $66150.00. Signed and numbered. Classic Cartier dimensional hammered finish 18kt. yellow gold doorknocker clip and back earrings circa 1950. 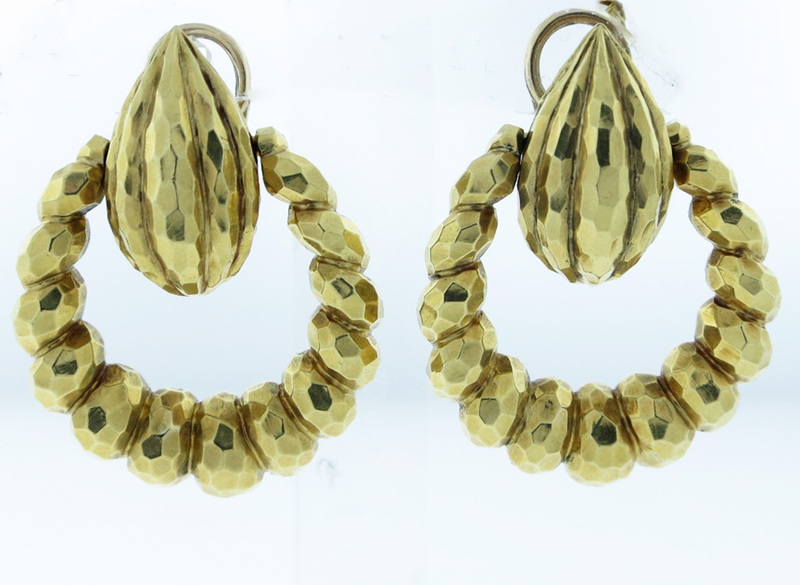 Each earring measures approx 1 1/2 inches in length. Tiffany & Co. turquoise center flower brooch in 18kt. yellow textured gold. The brooch measures approx 2 1/2 inches in length. The brooch is circa 1960. 18kt. yellow gold brushed finish carved tumbled natural aquamarine necklace by the Brazilian designer Burle Marx circa 1970. The necklace measures approx 16 inches in length with graduated 2 1/2 drops and is set with eight large faceted natural aquamarines. Timeless design 18kt. yellow gold undulating frame onyx center earrings, the onyx measures approx 13.0 mm. Clip and post back. Iconic " Croisillion " Schlumberger cobalt blue enamel bracelet circa 1960. The bracelet measures 6 1/2 inches internal circumference and weighs 78.8 gr. 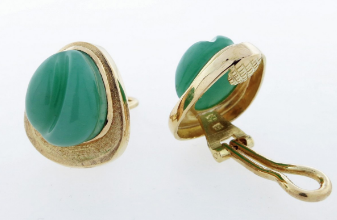 18kt yellow gold Florentine finish clip back earrings made by the Brazilian modernist jeweler Burle Marx circa 1970. Posts can be added. Articulated 18kt. yellow gold fringe bracelet measuring 7 inches in length made by Orlandini of Italy. The bracelet is accented with seven dangling bezel set diamonds in white gold . Graceful 18kt. yellow and white gold diamond leaf design diamond ring made by Cartier. 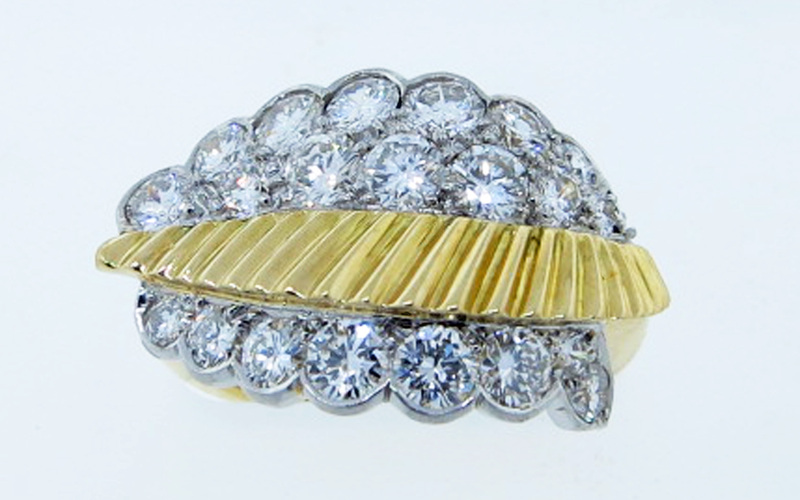 The ring is bezel set with 23 round brilliant cut diamonds totaling approx. 1.7 cts. grading VS clarity G color. The ring is size 4 and can be sized. Beautiful textured necklace made by Hermes. The necklace measures 16 inches in length weighing 110 gr. Made in Paris. 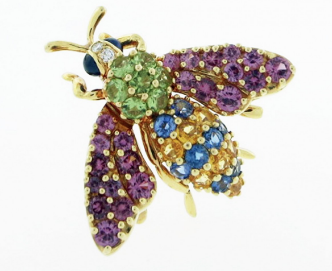 Ladies Boucheron France 18kt. 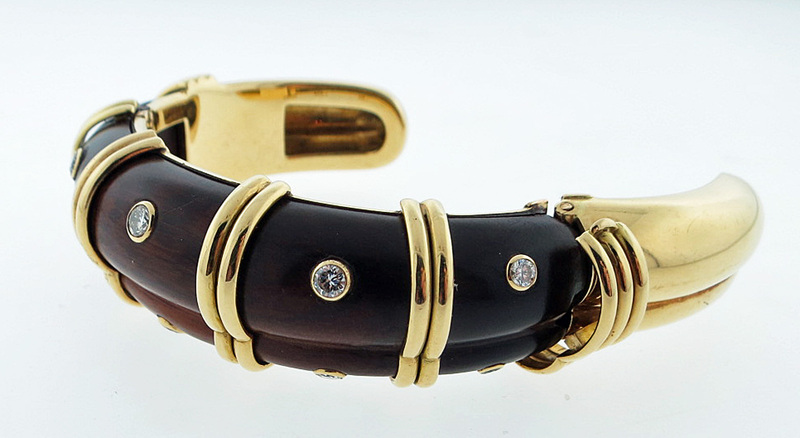 yellow gold fruit wood cuff .The slightly tapering top measures approx .75 inches wide and is bezel set with ten round brilliant cut diamonds totaling approx .75 cts. The cuff will fit most wrists and weighs 92.1 gr. The original box included. 18 kt. white gold diamond Eastern inspired diamond symbol made by Cartier on a black silk cord. The necklace retailed for $15,000. 18kt. yellow gold Bulgari white ceramic ring made in Italy. 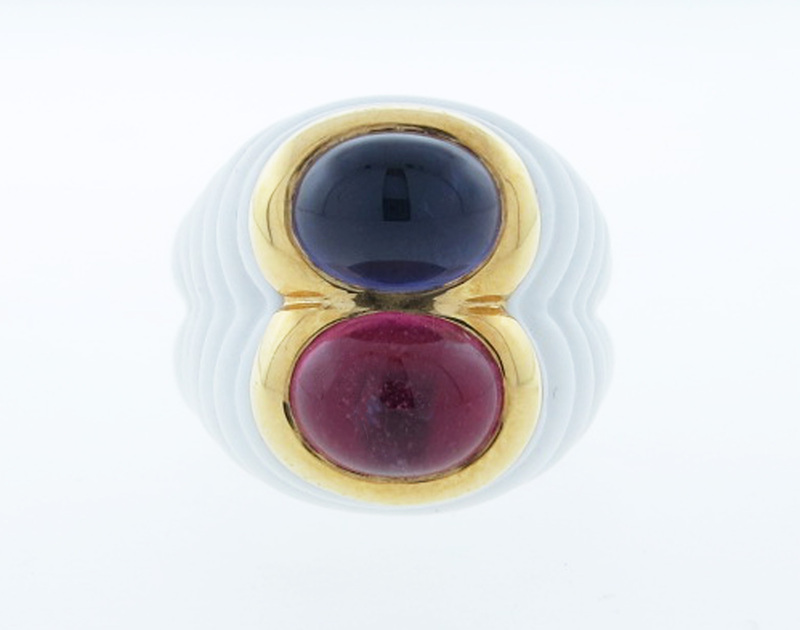 The ring is bezel set with a cabochon iolite and pink tourmaline. Size 6. 18kt. yellow gold turquoise and cabochon ruby earrings designed by Paloma Picasso for Tiffany & Co. circa 1982. Each earring measures approx 1 inch in length.Posts can be added. 18kt. 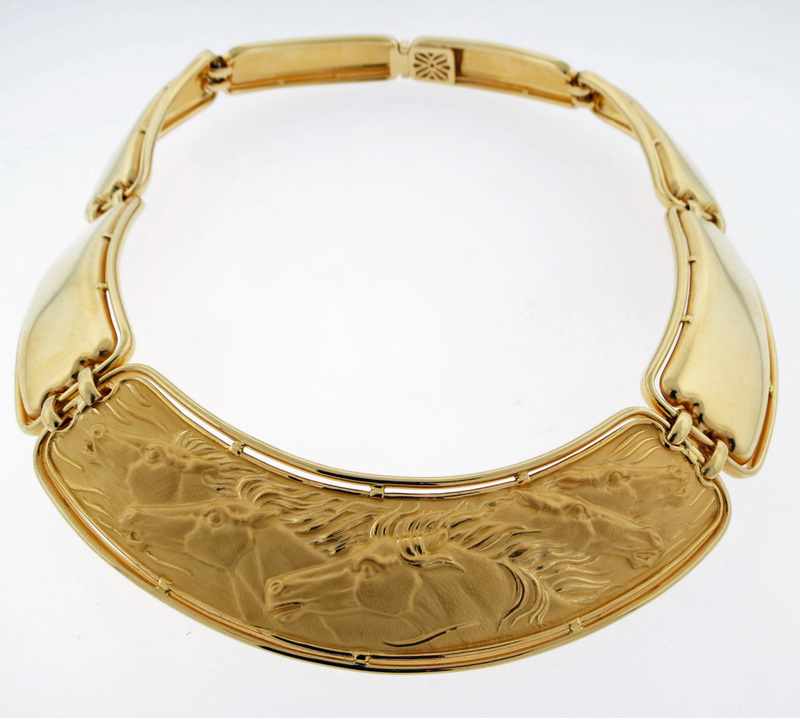 two finish graduating horse motif choker. The necklace measures 1 inch in width at the front and tapers gracefully to the back. weighing 97.6 gr. Made in Spain. 18kt. yellow gold Laura Munder coral and pink tourmaline necklace measuring 18 inches in length and 1 1/4 inches in length in an open free flowing modernist design. Open work 18kt. yellow, white and pink ball dangle earrings with diamond accents made by Roberto Coin measuring 2 inches in length.